IndusInd Bank (इंडसइंड बैंक) is a Mumbai based private sector bank that offers multiple types of credit cards for imbursement comfort of its valuable customers. The types of credit cards that the bank issues in this moment are Super Premium, Premium, and Co-branded credit cards. Modern advanced technology helps IndusInd Bank to provide better customer service for credit card bill payment. This is the easiest way to pay your credit card bill online using billdesk. No need to wait in a long queue, just open the link https://www.billdesk.com/pgidsk/pgmerc/induscard/indus_card.jsp from anywhere in the globe. 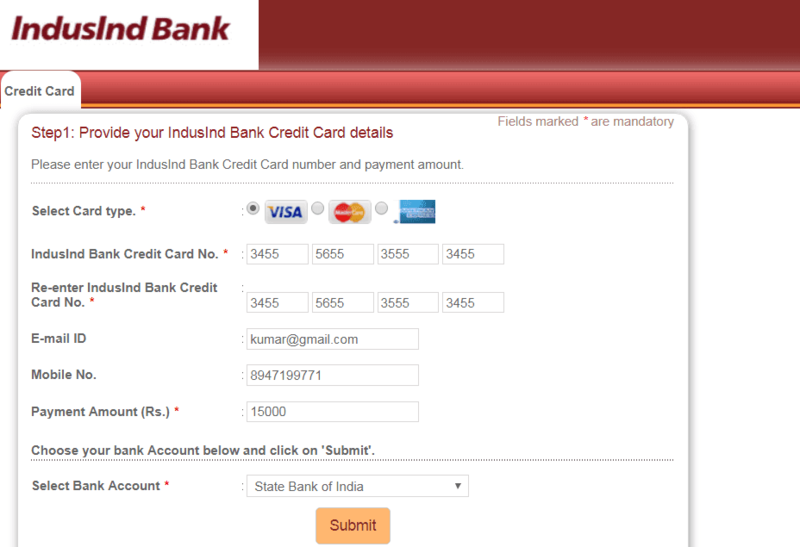 Fill out the Indusind credit card details and select the bank having net banking account from which you want to send the bill amount and press the 'Submit' button. You will be able to pay your credit card bill amount using your bank net banking account. Waiting in a long queue in your bank branch or waiting for a demand draft preparation, writing the cheque which will take time to clear - if all these are boring to you. Here is the solution waiting for you. Visa Credit Card Bill payment system introduced by the bank makes bill payment faster and easier. It's completely free that you only need beneficiary's VISA Credit Card number to make your payment. Funds transfer through IndusNet Net Banking. Just choose the 'Visa Credit Card Bill Payment' option. Now choose your bank account through which you wish to transfer your funds. Enter the Bank's Beneficiary credit card number and then confirm your transaction. Now with your User Id and password login to IndusNet Internet Banking. Now validate your transaction through OPT or transaction password you receive from the bank. You can also pay your credit card dues from any other bank that has NEFT/IMPS/RTGS facility on net banking. This is an added advantage for the cardholders who have no savings account in the IndusInd Bank. You have to register for net banking before making your payment. IFSC Code: It should be collected from the credit card company. IFSC code for Indusind bank is INDB0000018. Put correct IFSC code ( INDB0000018) and 16 digit credit card number. You are now ready to make your payment on credit card bill using NEFT or RTGS or IMPS. However, the other options you may opt for your payment are Auto debit facility, NACH facility etc.